Washington (CNN) -- The most dangerous threat for U.S. troops in Afghanistan has come from roadside bombs -- often referred to as IEDs, short for improvised explosive devices. Roadside bombs killed eight U.S. troops in southern Afghanistan on Tuesday, along with an Afghan civilian working with NATO forces, U.S. military officials said. IEDs in Afghanistan are the "number one threat," said Adm. Mike Mullen, chairman of the Joint Chiefs of Staff. They account for "70 to 80" percent of casualties, according to according Lt. Gen. Thomas Metz, director of the military's Joint Improvised Explosive Device Defeat Organization. 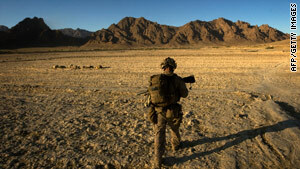 The Pentagon has said that since 2007, the number of IEDs in Afghanistan has jumped 350 percent. Although many of the bombs are found before they detonate, the number of troops killed has increased by more than 400 percent, and the number of wounded is up more 700 percent over the past two years. Last month, U.S. Defense Secretary Robert Gates approved a deployment of up to 3,000 U.S. troops to Afghanistan to deal with the growing threat from roadside bombs. And since the spring, the Pentagon has sent 3,416 of the regular Mine-Resistant Ambush Protected vehicles and 12 new Multipurpose All-Terrain Vehicles, designed to protect against roadside bombs. Pentagon spokesman Geoff Morrell said at the time that Gates determined that "this is a requirement that needs to be fulfilled. The forces there now require more IED protection." Metz said Tuesday that IEDs are "much more primitive in Afghanistan" because they use "less military munitions and more homemade explosives." But he said that although the military has been able to disarm many IEDs, the big challenge going forward is detecting devices using tiny wires. But he is confident that the military will soon be able to detect wires and other challenges through the use of new programs and military exercises. He said that if President Obama decides to send more troops to Afghanistan, as he is considering, there will probably be more IED attacks. The Taliban's capacity to manufacture bombs, train attackers and target U.S. troops has grown over the past year, officials have noted. Officials said Tuesday's attack was complex: multiple bombs and small arms fire used at the same time. Afghanistan's rugged terrain has made it easy for insurgents to hide roadside bombs in a short period of time. "You have disturbed earth all the time," Gen. Montgomery Meigs, former head of the Department of Defense's IED Task Force, said last month. "Especially close to villages and close to intersections -- that just makes the seeing and finding, even by soldiers' eyes, a lot more complicated." The southern area of Afghanistan is notoriously dangerous for U.S. troops. The area around Kandahar is filled with a large contingent of Taliban aimed at ridding the area of any American presence, one expert said. "A lot of the Taliban headquarters is in Kandahar among the Pashtuns. They do have a deeply felt antagonism of anyone trying to control them or occupy their government," said Steve Clemons, an expert on Afghanistan for the nonpartisan New America Foundation. Tuesday's attacks came a day after 14 Americans were killed in a pair of helicopter crashes in Afghanistan. It was the most Americans killed in Afghanistan in a single day in more than four years. With the deaths of two troops Sunday, 24 Americans -- most of them military -- have been killed in a 48-hour period. That makes October, with 58 fatalities, the deadliest month for the U.S. military since the Afghanistan war began in October 2001.